Upset City, Cinderella Story, March Sadness Enforcement Squad. Maybe that’s what the rest of the country is calling the hottest conference in Women’s College Basketball, but up here, we like to call it #MACtion. Whether it’s the coaches, administrations, players, fans or media members like myself, the Mid American Conference “hoop loop” has been completely spoiled with some fantastic basketball this season. Going into the Women’s Sweet 16, our shoulders are held very high behind two incredible MAC teams in the Central Michigan Chippewas and the Buffalo Bulls. These young women are representing everything we have been, quite frankly, LUCKY to have witnessed over the regular season. First and foremost, both play with tremendous passion and never cheat the sport with a lack of compete level – they come to play EVERY SINGLE DAY…. It’s inspiring. While I could list off stats and a whole bunch of numbers… my favorite being the 187 points that were combined in the MAC Final where CMU left with a 96-91 victory. It wasn’t surprising- both have extremely high powered offences. However beyond all the numbers and stats, they kind of take a back seat at this point in the season. With 16 teams left standing in the entire country, it’s all about game plans, execution and energy. This is the first time in over twenty seasons the MAC has sent an At Large bid to the Big Dance, but without a doubt, this was not a fault by the selection committee. Both CMU and UB received 11 seeds, and both handled 6 seeds in the First Round. Central Michigan took out (No. 24)LSU 78-69 while Buffalo knocked out ( No.19) USF 102- 79. There were only 3 teams to reach 100 points in that first round of games. UConn, Tennessee and Buffalo…… oh hey there MAC! Enter the field of 32 and while many people thought it was nice while it lasted…. those who have followed the MAC, well, we knew better then to count either squads out. Here’s where things get especially good- not only did both programs get W’s BUT they didn’t just sneak by national powerhouse programs. CMU toppled (No. 10)Ohio State out of the Big10 with a 95-78 final and Buffalo completely dominated (No. 11) Florida State from the ACC on their home court 86- 65. Before this year’s tournament started, there had only ever been one MAC team to reach the Sweet 16 (Bowling Green in 2007)- now there are 3 all time. The Sweet 16 matchups are set for both MAC programs. Central Michigan will have to travel cross country to Spokane to take on 2 seed (No. 6) Oregon while Buffalo will have a much more closer-to-home vibe squaring off in Albany. They will face defending National Champs, also a 2 seed in (No. 7) South Carolina. 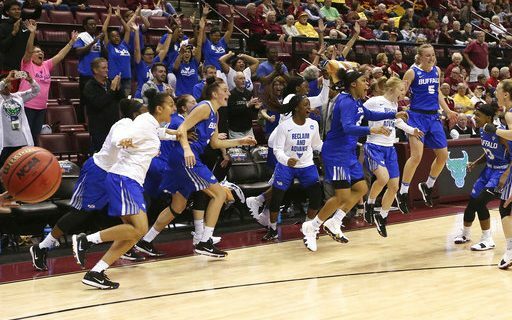 This year’s Woman’s NCAA Sweet 16 will feature 2 games that are 2 vs 11 matchups. That is a rarity in itself but even more special is that BOTH 11 seeds are hailing out of the Mid American Conference, a “mid-major” that has run through Power 5’s on the biggest stage possible. How can the argument stand that this is a fluke, or a Cinderella run?! Central Michigan and Buffalo are both VERY good teams who are playing with high confidence and doing the single most important thing in March- winning. The MAC has been a tough place to survive and the world is finally seeing it.